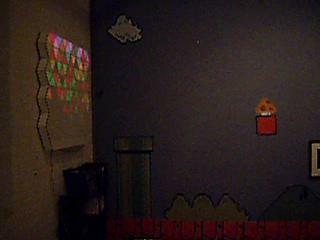 I took all of today (Thursday) off from work just so I'd have enough time to finish fixing the wall. It took me, in total, about 6 hours to completely do everything. I tried using some superglue to fix the mashed wall section, but I doubt it did any good. The "wood product" used in this area is so porous, that the super glue just kinda soaks in and disappears. I taped it together for a while to let the glue set, and then just covered it all up with more aluminum tape. The final step was painting the outside. It took quite a bit of paint (relatively speaking), because like I said before, the wood is very porous without the hard markerboard surface, that it just soaked up much of the paint. In the end, the area was cleaned up pretty well. I felt like a plastic surgeon from the 1940's for war injuries. Just fix it up enough to function. The acrylic was fairly easy to cut. 2 scores to get it to the "rough" rectangular shape, and then another 6 triangular wedges, with 8 scores, and the whole piece was completely cut. The contact paper was pretty annoying, and I think it looks horrible close-up without the lights on, but you really can't see anything bad when it's 5 feet away and/or the lights are on. I didn't really have a whole lot of time to deal with trying to get it to look perfect, so I had to just leave it as it is. I drilled 8 holes, 2 per piece of wood, for securing the mounting blocks to the wall, and used 1 1/2" #8 bolts to secure them to the wall. Hopefully, with those and the Liquid Nailz, it shouldn't come loose again. The velcro took the bear's share of the time, at probably about 4-4.5 hours. It's a very tedious operation. Oh well, such is the way of things. I then used 1" screws (instead of 3/4") to secure the mounting hardware to the wall, so that it actually goes into both pieces of wood. After making all of the updates, I made the tricky decision of hanging it back up where it was before. I would be very, very surprised if the mounting brackets gave way again. At this point, about all I can do is hope for the best. I will be at the opening tomorrow from maybe 6:30 or so until who knows how late. That is all, signing off. The lengths of the sides of a triangle are 2, 3, and x, and the area of the triangle is also x. Find x.